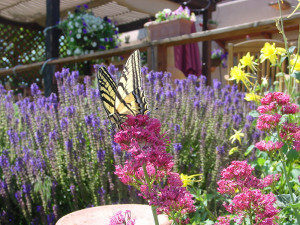 A stay at the Leroux Creek Inn is like being transported to a chateau in Provence. Innkeepers Yvon and Joanna consider every detail, right down to the cozy Sleep Number bed! The large windows in our room opened to an expansive view of the vineyards, allowing a fresh breeze to drift in by day, and awesome gazing of stars at night. Breakfast was taken on the patio, and included fresh fruits and other goodies from local producers. The hot tub, set in its own private corner of the gardens, invites guests to relax after a day of “hiking” the West Elks Wine Trail here in the North Fork Valley of the Gunnison River. This B and B went above and beyond our expectations. Yvon and Joanna were excellent hosts. We stayed for two days. Upon check in Joanna should us our room, we were in the suite, and how to work the jetted tub in case we wanted to use it. She showed us around the home and grounds. She gave us some suggestions as to where to eat dinner at. The breakfast the first day was a quiche, they had coffee, tea, juices, some cheeses and breads that the French would eat. Very delicious, (this from someone who is a picky eater), talking to some of the other guests they gave us some suggestions of what to do in and around Southwestern Colorado. After spending the day exploring we went back to the room and fell asleep almost instantly. Our second morning breakfast was French toast, (not the way Americans make it) with cream cheese and pears in it, very tasty. Before heading out to go back to our home state we were watching the wild turkey running around on the deck. I would totally recommend staying at this place if you are ever in Southwestern Colorado. They are only open from May 31 to the end of October during harvest season. 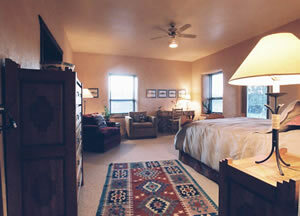 A lovely B&B overlooking a vineyard in the peaceful valley of the North Fork, Gunnison River. The proprietors, Joanna and Yvon, are delightful people with interesting backgrounds and excellent local knowledge. Breakfast (cooked by Yvon) is the best we’ve ever had at a B&B. Ask Yvon about the excellent local cycling! 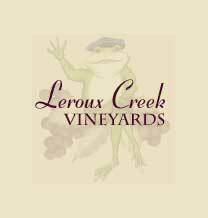 What a delightful welcome, and what a splendid time we had at Leroux Creek Vineyards! Joanna’s warmth, energy and humor set the tone for our visit… and Yvon regaled us in his wine tasting room moments after our arrival. And I mean regaled! Wonderful stories, lots of laughing, and alot of knowledge shared. 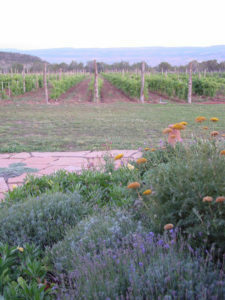 What a great way to fully appreciate the land he and Joanna have cultivated into health and vigor, learn of the particular vines he chose for the North Fork Valley’s dry soils and conditions, and follow the couple’s processes in bringing their acres of verdant vines into a yield of several lovely wines. We sampled them all. Each– wonderful in their own way, the result of these two people’s knowledge, caring and labor. And this was just the beginning of a great 2 days. Besides enjoying just hanging out in spirited conversation with our hosts, and enjoying their extremely comfortable hacienda with its blooming gardens, fabulous valley views (and nice hot tub), we explored country roads, sampled daytime meals from fruit-laden roadstands, visited artist studios, sampled other vineyards’ offerings, meandered the cliffs of the Gunnison’s Black Gorge, and hiked our hosts’ creekbeds with their dog. Yvon’s extraordinary cooking (we were fortunate to join him and Joanna for dinner one evening) was another highlight. And guests will sleep well — all the the bedrooms are spacious and welcoming, with southwestern touches and bathrooms stocked with Joanna’s own rich grapeseed-based creams and lotions. In all, a fabulous visit. A big Thank You to our hosts! One week into our Colorado road trip, we left the mountainous landscapes and the snow, admiring the changing scenery as we headed twards Hotchkiss and our stay at the Leroux Winery and Inn. The booking process had been one of the most laidback I have ever encountered. I emailed asking if there was any availability on the dates I wanted and got an email back saying “yes…we look forward to seeing you”. No lengthy forms to fill in, no deposit or credit card details. We knew even then we were going to have a good time. The Inn itself is wonderful. We were in the Master Vineyard Suite and it was gorgeous. We have stayed in France many times and were amazed to find this little piece of relaxed French style and ambiance in the middle of a small Coloradoan town. 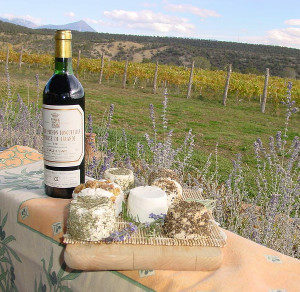 As recommended by our hosts on our first evening we ate in PJs, a small bar/restaurant that serves incredibly good and imaginative food, and then returned to the Inn to choose a bottle of wine to drink on our terrace overlooking the haphazard yet charming French styled landscape. Breakfast was typically French and delicious – fruit , cheeses and breads. And on our second morning Eggs Benedict. On the evening of our second day we attended a family style farm dinner at a neighbouring farm, which was fantastic. Our hosts Yvon and Joanna were both very friendly and engaging. Yvon is well known throughout the valley as the “mad frenchman”, a reputation I am sure he cherishes. We were really sorry not to have had more time there, but we have brought home many happy memories, as well as a bottle of Rose that Yvon bottled specially for us.